The Academy of Dance Arts creates high quality, vibrant dance lessons and family-friendly, safe learning environments for growing dancers of all ages and abilities, one step at a time! Serving more than 300 families in Western South Dakota and Eastern Wyoming, our expansion at 230 Main Street now brings three convenient locations and certified programs to the Northern Hills (Sturgis), West side (Rapid City) and Downtown (Rapid City). Grow: technique, confidence, relationships, big dreams! We invite you to Discover, Dance & Grow with us! We are proud to be a More Than Just Great Dancing Studio! Learn more about MTJGD. Where is the Academy of Dance Arts located? Sturgis Community Center: Sturgis students dance inside the active Sturgis Community Center at 1401 Lazelle Street. We host classes in the newly remodeled dance room next to the theatre, and our Fall 2018 classes will leap into Wednesdays with Ms. Janie! 4251 Canyon Lake Drive, Rapid City: Our Early Childhood through Level II classes offer more variety and convenient after-work times than ever at the Canyon Lake Drive studio! Located just behind the Common Cents car wash on the corner of Jackson Blvd. and Canyon Lake Drive, this spot is ideal to bring your dancer and observe through the viewing window, enjoy a dog walk in the park just across the street or take a quick run! 230 Main St., Rapid City: Our newest Downtown gallery location offers expansive room to move, with 12’ ceilings, a state-of-the-art sprung AND floating dance flooring system, plus a footprint equal to our City theatre. Level III+ classes, our Performance Companies and Events will experience more chances to dance in the heart of the City’s latest improvement district. Within a block of Armadillos Ice Cream, Pure Bean Coffee and Kicks and Giggles, families can take time to shop or relax with a treat while their dancers actively pursue their goals and dreams. Sturgis: The Community Center provides plenty of paved parking in front and at the rear, near the theater. 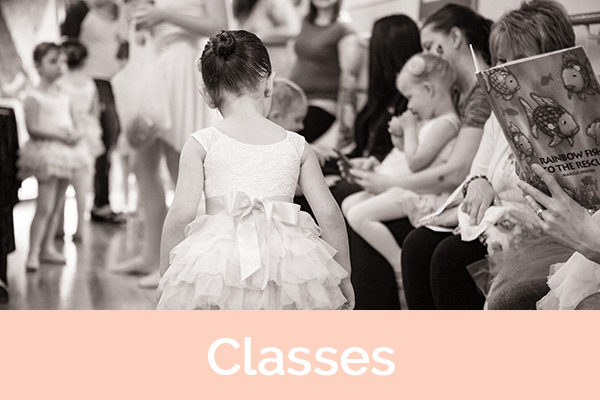 We ask that families of young children bring dancers to the door to greet the instructor at the beginning of class and meet them again when class is finished. Canyon Lake Drive, Rapid City: We provide parking in the gravel lot adjacent to the studio, and in our overflow lot across the alley, bordered with our white fence. All property is owned by the Academy of Dance Arts, and is available to families of our studios for parking. We also have free WIFI access. 230 Main Street, Rapid City: Free, non-metered parking along both Main Street and Third Street is available throughout the day. After 5pm, the East lot adjacent to the studios will be available after construction on the adjacent building is completed too, so adding all three sides of parking makes for plenty of options. How long has the Academy of Dance Arts been around? 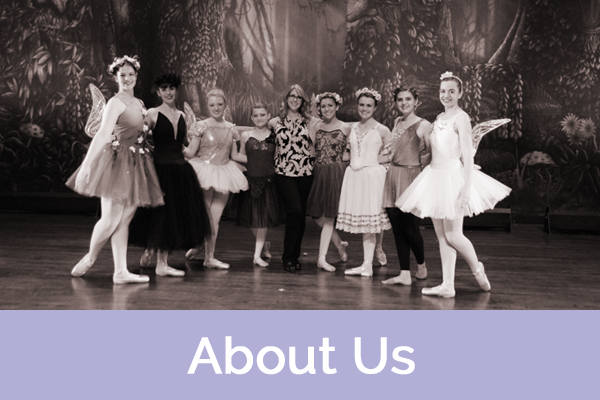 Longer than any dance studios in the region, because of our commitment to quality, whole-child education and artistry! Nearly 50 years ago, Helen Griffiths sold the Academy to Kay Schneider, who grew professional dancers and programs across our State, and founded both Black Hills Dance Theatre and co-founded the South Dakota Dance Network, with programs still active today! In 2000 Miss Kay’s student and former professional dancer Julie McFarland purchased the Academy and added “Arts” to our name, to better show what we do best! Many of our Academy students are children and grandchildren of Alumni. Our certified, generous, innovative team of professional teaching artists, community outreach collaborators, and client care specialists continues to grow in our single-hearted devotion to serve our students with integrity. We believe every child matters and do our very best to see individual results, goals and dreams are achieved within our supportive family environment. Can I stay in the studio to watch my child/children during class time? Of course! We love having caregivers respectfully observe the process. We also understand that busy schedules mean an hour is just enough time to shop for groceries, too! You are free to choose the style that best suits your family. For our youngest dancers, we follow our student’s lead, and offer many solutions to the larger question to stay. Experience tells us some of our Early Childhood dancers prefer a closed door to feel most comfortable exploring movement in their environment. Our answer for parents is a giant viewing window at the Canyon Lake Drive location, to allow caregivers to see every move while the student uses it as a mirror. The dancer has fewer distractions, while parents still see the care, progress and direction our faculty give. If your child needs an open door and is hesitant to leave your side, they are free to visit the waiting area as needed for initial classes, and we gently encourage greater lengths of time in the classroom as we go! With our intrinsic learning approach we don’t force results, but allow the freedom within a structure to explore and grow. Our dress codes are simple and available for purchase at the Academy on Main! We can order and provide delivery to your class studio location in Sturgis or Rapid City. Purchase a leotard, tights and shoes together and receive a drawstring backpack on us! Early Childhood Pink unskirted leotard, pink tights and pink ballet shoes. Black tights, leggings or track pants with a snug cuff, white tee and black ballet shoes. Hair pulled back of the face. For the last class of each month, girls can wear a skirt and boys can wear a solid colored tee. Ballet Level I-VI Black unskirted leotard, pink tights and pink ballet shoes, with hair secured in a bun in order to attend class. Black tights, leggings or track pants with a snug cuff, black dance belt athletic support, white tee and black ballet shoes. For the last class of each month, girls can wear a skirt and boys can wear a solid colored tee. Tap Early Childhood Students wear Black Patent Tap shoes, and progress to a tap oxford for more advanced levels. Tap oxford. Both can wear Black Jazz pants or any of the attire listed above. Jazz Black split sole jazz shoes with black jazz pants and any of the attire listed above. Same as ballet with black jazz shoes. Hip Hop Black split sole jazz shoe, hip hop shoe or clean tennis shoe for upper division levels. Clean tennis shoes. Dance sweats or any of the attire listed above. Modern Bare feet, with black capri tights and a leotard. Same as ballet with bare feet. Pointe Initial pointe shoe fittings are partnered with our supplier and director, and are scheduled during the summer. We carry accessories on hand and can help to re-order as needed. Hair must be up and secured in a bun. Regular enrollment in at least two Ballet III classes weekly is required for at least one year in order to build necessary strength required for pointe evaluation and readiness. Do you have any performances through the year? Yes, it’s one of the things we do best! 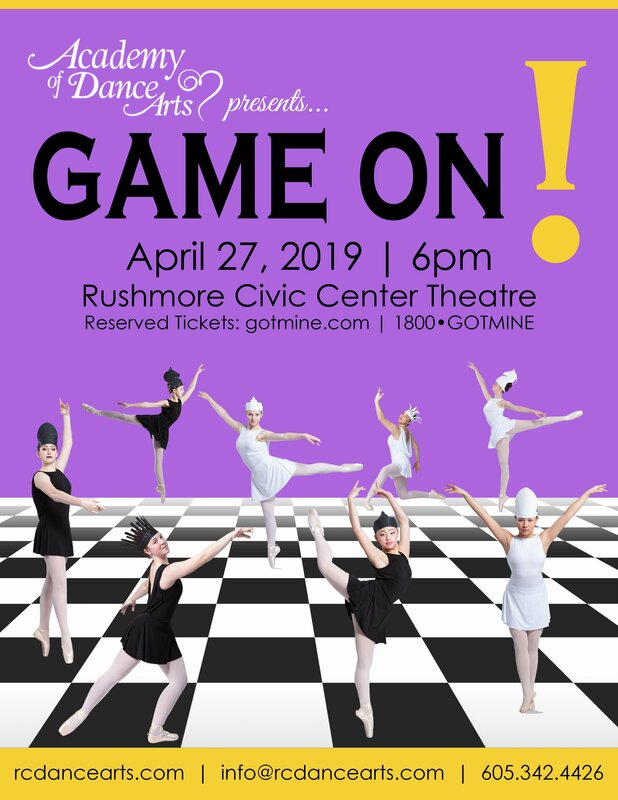 Every child enrolled in school year classes is invited to be a part of our annual Spring performances, now in our 19th year with the Rushmore Civic Center Fine Arts Theatre, the largest in the region! 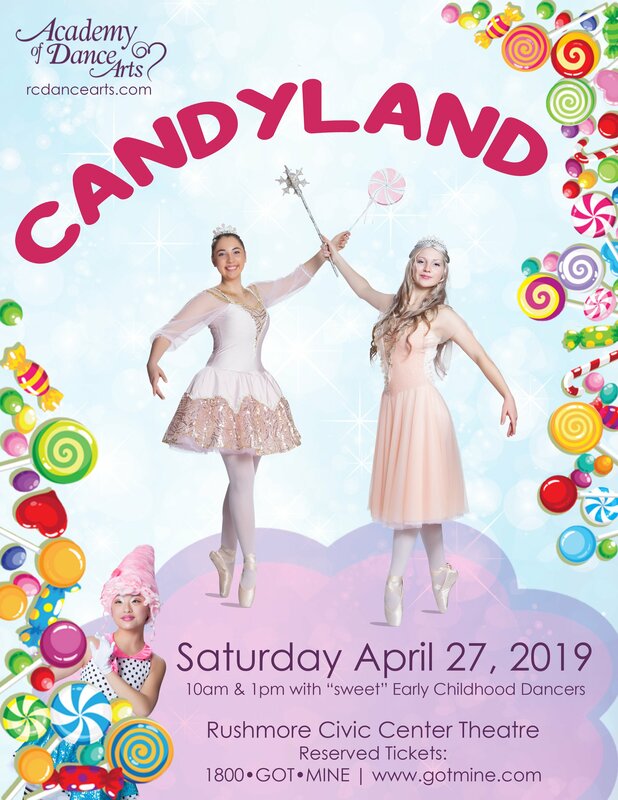 Our performance costumes, choreography and music selections all are age appropriate and chosen to celebrate childhood, rather than early-onset adulthood! 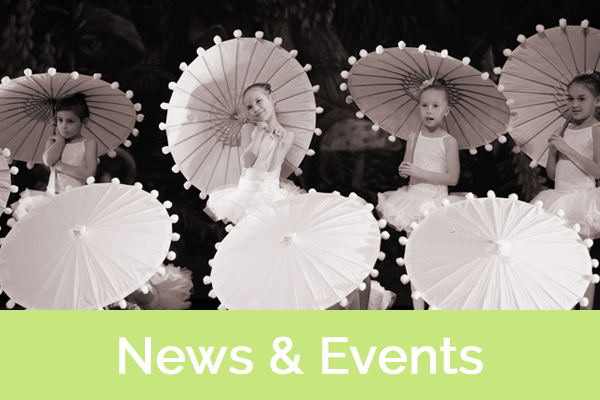 Held the last weekend in April, we host Saturday matinees for the Childhood Dancers up to Level 1, and a separate 6-8pm evening feature with all students and pre-professionals in Level II and beyond. Every-other-year we rotate between theme and story formats, in original tales created for our dancers by our director and faculty to allow students of all levels to shine! Our graduation and awards are held at the end of the evening performance. 1. Academy Company is in our 8th year providing dance concert benefit performances, now in conjunction with the Choose Art and Lifeways projects in the schools to support peers facing challenges with alcohol or substance abuse issues. We return to the Performing Arts Center in early March 2019. 2. Steps of Praise is our liturgical company, available for performances in worship settings. 3. Visions of Sugarplums is part of the Black Hills Symphony Orchestra’s 2018-19 Season Ticket, and we’ve been invited to bring those dreams to life in a fun and exciting Holiday performance collaboration! Up to 30 Academy Dancers will participate in our festive nod-to-Nutcracker with LIVE music. Support our local artists, musicians and dancers and mark your calendars now for the December 1 event! Why dance at the Academy? Providing your child with the best opportunities to explore and grow in a safe, nurturing environment is one of the biggest challenges parents and caregivers face. Given the many choices, picking the best fit for your child may seem daunting. Small Classes: We limit class sizes, for the highest quality focus and personal attention possible. We don’t strive to be the largest studios because we don’t want to skimp on quality, or miss students if they are lost in a sea of bodies. No one is invisible in our classrooms. Whole-child philosophies: our experienced teachers value every student, because every person matters. We understand that every person is unique in learning styles, ability, physique, personality and more. With that in mind, our teachers strive to provide individualized attention and instruction. We meet students where they are! Safety: We train dancers with safe, proven methods for injury-prevention in mind ~ we are born with just one instrument, one body to use so we encourage our dancers to care for it well! In the event that a student needs special accommodations (due to injuries from other activities) we SAFELY offer opportunities for best class modifications with caregiver/doctor's permission. Best Practices: 100% of our faculty are certified in first aid and CPR. We are also certified in specific techniques and methods of training to bring out the best in your dancer: Vaganova, Progressing Ballet Technique (PBT), Acrodance, and Yoga are the latest 2018 additions to our pro faculty training skills. Reputation: We have a reputation as a drama-free zone. We lead, mentor and guide dancers as young people of character and integrity, growing together in community. Recognition: The first studio awarded recognition by the National Dance Education Organization (NDEO) in South Dakota to start a chapter of the National Honor Society for Dance Arts (NHSDA). Inductees are awarded points for leadership, dance artistry and academic excellence, and may apply for national scholarships. For more information, please click here. We provide room to explore and grow: The only studio with three convenient locations serving the Black Hills region, we have hardwood flooring for drum-worthy tapping resonance, a remodeled floor in Sturgis and a full theatre-sized sprung marley floor for those who reach farther and dance larger downtown! Protected Childhoods & Family Values: Digital media is descending with light speed on the magic of childhood, offering instant results in a virtual reality, and competing with quality family time, friendships and healthy physical activity. Because we recognize how precious those irreplaceable years are, we get kids into the real world by teaching healthy movement and sound technique, building lasting friendships, growing social skills, finding mentors and dreaming big to achieve real-world goals! Joy! : Imagine seeing your child bounce out of class with a huge smile on their face because they’ve made new friends and learned new skills to build their confidence and abilities! Our motto to “Be Bold, Be Brave and Be your Best” is one way we encourage students to grow one joyful and strong step at a time! We look forward to helping you to grow your budding dancer, one lovely step at a time!